Why Choose Distraction Fishing Charters! 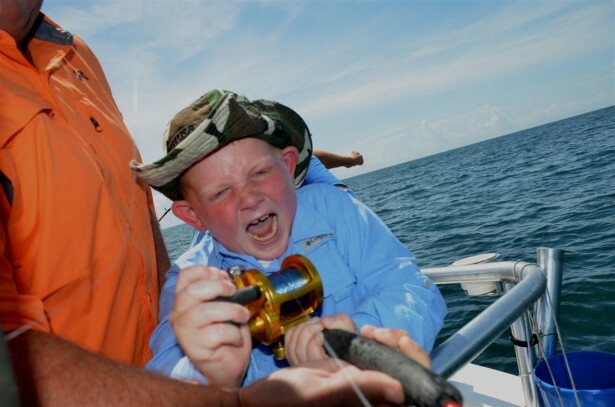 We specialize in family fun and love to see your kids faces as they reel in a big fish. The best reason we can think of for choosing Distraction Charters is we offer the Best Service and Best overall fishing trips in Alabama! We really care if you have a good time. Being the first 6 passenger charter boat in the nation to specialize in family fishing back in 2002, has been one of the most rewarding things we have ever done. Being able to actually spend time with you and your children while showing you a good time and catching a few fish is what drives us. One thing for sure, when you allow Captain Troy and the crew of the Distraction to serve you the way we do, you will walk away completely satisfied or we will make it right. We can’t guarantee anyone that you will catch fish or even keep a limit of anything. We will promise you that we will treat you with respect and serve you better than any other fishing guide in Orange Beach, Alabama. The owner of the boat is your captain: This is important because an owner has a vested interest in insuring you get a return on your investment. The captain and crew of the boat are drug and alcohol free: We are members of a random drug and alcohol testing program. The charter boat is fully licensed and insured: We are licensed in Alabama and Florida State waters, as well as federally permitted to operate out to 200 nm offshore. We are also fully insured. We give you more fishing time and less riding: We run a little faster and take you straight to where we think we can catch you the most fish. We don’t idle out trying to save a little fuel money. Because you booked direct with us, we have the fuel budgeted and we will burn it in order to give you the best fishing trip. We don’t make you catch your own bait: On our 6 hour trips or less, we don’t stop under the bridge or in the pass trying to catch bait. This kills up to 30 minutes of your fishing time. We have all of the bait you will need on board to make your trip a success. New and well maintained fishing tackle: Our rods and reels are commercial quality and they see more use in one week than most fishing poles see all year. For that reason, we do our best to maintain our tackle very well. It would be too expensive to replace everything each year. So, we have a rotation schedule that we follow. We get rid of the old reels that we can’t get parts for and we replace our rods every couple to three years. If you are fishing with a reel that malfunctions, we will give you another one to use. Our charter boat: Our boat older, but it is well maintained, enclosed air conditioned cabin, clean interior and exterior, comfortable and best of all, it has a private indoor restroom. When you choose a fishing charter, you are choosing the captain and crew to take care of you, entertain you and to make sure you get the best fishing trip and experience you can. 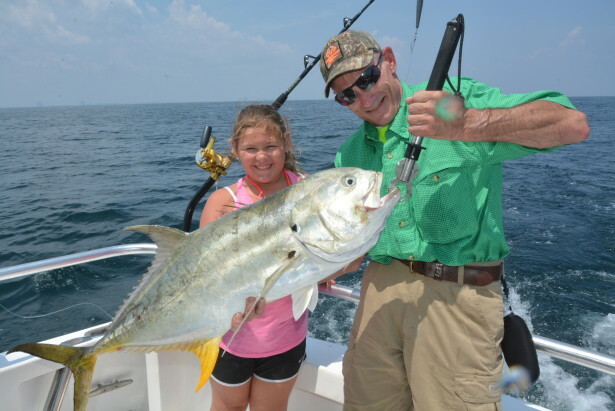 Captain Troy is different than any other fishing guides in Orange Beach. 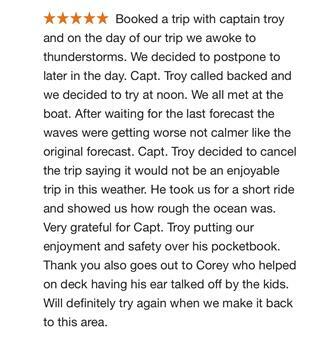 From the moment you make your initial reservation request until the time you step off the boat, you have someone who really cares about you and your family and if you had a good time. We are in the business of serving people. To us, there is nothing more important than ensuring that everyone (kids especially) who walks down our dock and steps on our boat, knows how much we care about them. We don’t just advertise how much we like serving people, we actually live it. When you meet our crew for the first time, you will breathe a sigh of relief, because you will know you have chosen the right charter company for your family. We are in the service business and our job is to keep rods bent and line peeling off your reel. One of the biggest challenges we all face as parents and grandparents, is trying to find professionally run, family friendly, safety oriented, hands on activities, where everyone who wants to participate, can do so at their own pace. 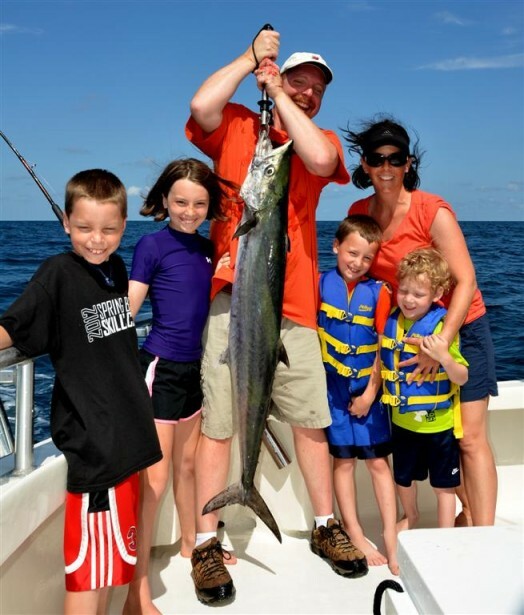 When it comes to finding a fishing charter that is “G” rated and family friendly, it is easier than you may think. 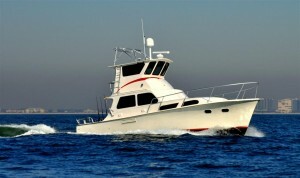 Distraction Charters is the first deep sea charter boat to cater only to families and has been doing so since 2002. One of the things people don’t realize is, finding the right charter boat for your family is easy, once you do some research and know what to look for. Below, I will give you a few things to consider when booking a fishing charter and how to judge whether or not this charter is professionally run or not. Whether you choose us or not, we want to give you the information that we have about Orange Beach Fishing Charters, so you will be empowered to make the best choice for your family. Sure, we want you to choose us, but we do understand that your wants may be more than we are able to provide. We are highly specialized in family fishing, but that doesn’t mean we don’t catch fish. We are different than any other charter around because of how are set up as servants / teachers and even though our trips are action packed, you will come away with so much more. We have no ego and don’t have to bring in coolers full of dead fish in order to sell tomorrows trip. That is not what we are about. Family fishing doesn’t mean you get less of a charter trip, it actually means you will get more. When we say, you get more, it simply means that we give you the personal attention and service that can be found nowhere else. Our job is to educate, demonstrate and help you learn how to catch saltwater fish all by yourself. We have a unique ability to take the shyest kids and bring them out of their comfort zone and let them experience things that they might miss if they were fishing with someone else. We make learning to fish, fun and the kids like how we take them through confidence building steps that will help them the rest of their lives. The first time anglers who fish with us really appreciate how gentle we are with their family, and for good reason. When you choose Distraction, you will get a charter crew that really cares if you have a good time and would do nothing to upset or offend you. Family and kid friendly fishing is our life blood and our passion. When you choose our services, you will be around a professional crew who always puts your happiness and safety before our personal gain. We have a vested interest in putting you on fish and serving you well. When you choose us, you will get a fishing charter that is so valuable, you will not find another one like it elsewhere. After you book your deep sea fishing trip, you will be able to relax, because you will know exactly what to expect to receive. That is because, we want what we do for you to be seen from every angle and backed up by hundreds of reviews of satisfied customers. With us, there are no surprises, no pressure, no up front or non-refundable deposits, no hidden agendas, no surcharges and there is certainly no wasting of your time. There is only excellent customer service and an honest effort to please your family. We don’t stress you out, hassle you, give you uncertainties or inconveniences. We know what you expect and we promise to do everything we can to help you relax and enjoy your time on the water. We understand that you don’t do this every day and we don’t expect you to know everything about charter or deep sea fishing. That is why we take the time to educate you and your family on how to use the tackle and then allow you participate at your own pace. We are calm and gentle with you at all times. We give you Nostalgia. Our boat is older, but she is newly restored, clean, with new engines, generator, safety system, etc. She is a Hatteras and when on board, you will go back in time of the early days offshore fishing when life was simple and life was good. Ernest Hemingway would have loved our boat. We will always put your happiness and safety before our personal gain. There is nothing more peaceful than knowing you have nothing to worry about except showing up and being ready to have a good deep sea fishing experience. If for some reason we feel that the sea conditions or weather might be questionable, we will communicate with you and explain why we are being cautious with your family. There is nothing more important than communicating with our guests and not taking chances or risk getting someone hurt or making them miserable. Actual Review proving that we will always put your happiness and safety before our personal gain. Satisfaction Guaranteed. We can’t control the weather, the sea conditions or what fish you will be able to catch or keep, but we do control how well we treat you. If for some reason you are not fully satisfied with the service you receive, let me know immediately and we will make it right. Why we care so much about you! President Reagan said that he had rather experience it once, instead of hearing it a thousand times. Caring about you is our nature. It’s how we live. It is who we are. It all goes back to the way we were raised. Also, my wife told me some 30 plus years ago that talk is cheap and that anyone can tell you they care about you. If you really want to let someone know you care about them, you have to show them. Come let us show you how much we care about you!